This is my all time favourite home made dish from Udipi, Karnataka - unfussy and rich, a must -try for all of you out there. 1. In a wok, gently fry the fenugreek seeds and the green chillies.Take care not to over do the seeds, else they will taste bitter. 2. In a mixie, grind the fenugreek seeds, the chillies with the freshly grated coconut. 3. Pour this mixture into a bowl. Add the curds. 4. Mix well. Add salt. 5. 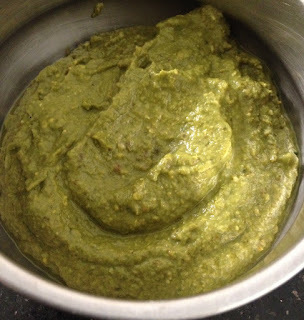 Splutter this curd mixture with mustard seeds and curry leaves.